Alex Grimm/GettyThe departure hall of Frankfurt International Airport in November 2010. A French family of four was accidentally let through Frankfurt Airport’s terminal despite being flagged by the system’s security checks. An airport worker accidentally sounded an alarm, and police briefly evacuated part of a terminal and stopped passengers from boarding their flights. The police lockdown was lifted after two hours. Photos and videos showed dozens of people streaming out of the terminal. 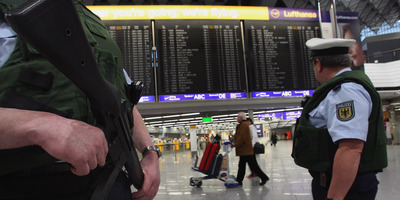 A terminal at Frankfurt Airport was briefly evacuated on Tuesday following reports that someone had walked past security without permission. Police stopped passengers from boarding flights and cleared out the security zone of Area A of Terminal 1 of the international airport around 12:30 p.m. local time. The lockdown was lifted two hours later, with police announcing airport operations resuming as normal. It turned out that the alarm to evacuate the terminal was accidentally triggered by an air safety assistant, federal police said in a tweet. A French family of four had been let through the terminal despite being flagged by the system while going through security. The family was later located, questioned, and allowed to continue on their travels. Photos and videos posted on social media during the evacuation showed dozens of people streaming out of the terminal.